As both a Huntingdon native and professor at Juniata College, Ryan Gibboney has the ability to act as a bridge between her hometown community and that of the College. Beginning in the fall 2016 semester, Gibboney started to empower her students to work with community partners through her Integrated Media Arts classes. Gibboney started by partnering her students with the Huntingdon Community Food Garden. Over the course of the semester, students created poster designs, captured video and photography and shared social media strategies and posts. Students’ work helped to completely redesign the way that volunteers for the garden are recruited and has significantly impacted the way that the garden is promoted throughout the community. In the fall of 2017, Gibboney and a class of students took on a community partner project, this time working with the Huntingdon Community Center (HCC) to develop their website, branding initiatives and video projects. By working to directly respond to the needs of the client, Gibboney says that these projects have “created hope for local organizations such as the Huntingdon Community Center who has an impact on thousands of families a year but has a small staff and is run primarily by volunteers.” When other colleges teach students similar design skills, mock scenarios are created. This means that students design logos, create posters and make websites that few will ever benefit from. 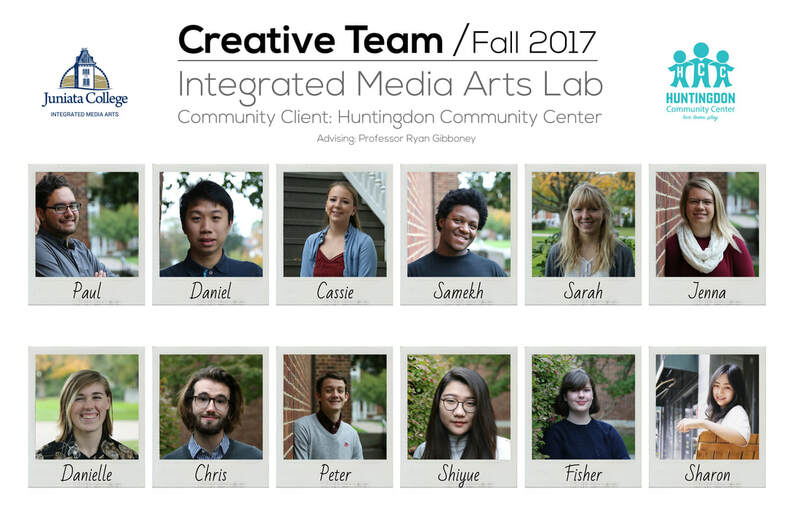 In her Integrated Media Arts Lab, Gibboney enables students to realize how much of a positive impact they can have on their community. When students are able to see their work being used, they gain confidence in their ability to create something beneficial. Gibboney stressed the importance of engaging and consulting with the community partner in order for the projects to be successful. “Unlike traditional creative work where the designer has the say, we work with the client—rather than designing for—in order to hear their needs, create within their abilities and design for their budgets,” Gibboney says. Christopher Peterson, a recent graduate of the College who worked on the project last semester, reflects, “One important thing I learned from this experience is to consider the resources and capabilities of the client when developing creative services for them. In deciding what features the site should have, we had to consider whether the HCC would have the resources to continue managing that feature.” HCC also emphasized the benefit of the partnerships built throughout the process. “We were able to meet the students in their classroom where we were able to get to know each other better,” REP says. “The students then came to our facilities where they could see what we do.” In the end, some students were even inspired to volunteer their time at the Community Center outside of working on their assigned project. Empathy and understanding between students and community partners is required for these projects to be successful. The creative content produced for local organizations is significant, but the partnerships between students and community members is the true product of these semester-long projects. Faculty members at Juniata have been busy growing the number of community-engaged courses being offered, and the positive buzz surrounding Gibboney’s course has the potential to encourage additional professors, students and community partners to want to take part in similar work.